Steve Physioc: Right down the middle for ball three. Rex Hudler: [laughing] Wowwwwww. Woo! We got away with one there. Physioc and Hudler were *on it. * They talked through a slow-motion replay and everything. And, I mean, the call was clearly absurd. It merited some attention. But we’re talking about a mid-September game between the White Sox and the Royals. At the end of the day, who cares, right? Still, the announcers were sufficiently locked in. Just four days later, we saw the true worst called ball of the season. 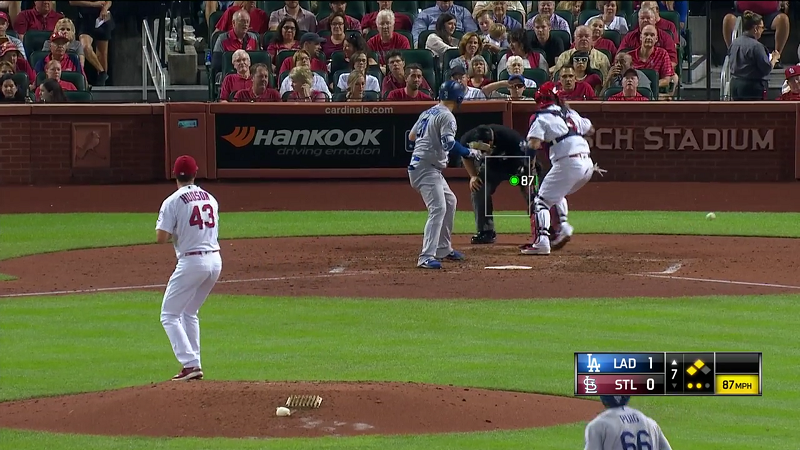 It happened in the seventh inning of a game between the playoff-hopeful Dodgers and the playoff-hopeful Cardinals. As usual, a pitch sailed right down the middle, and it wasn’t called as a strike. It obviously should’ve been a strike. But no one said a word about it. Not on either side, not on TV or radio. It was as if the call didn’t happen at all. The worst such call of an entire baseball season. That makes it sound ridiculous. Ridiculously negligent, on the part of everyone involved. In reality, there was a good reason. There’s usually a good reason. What happened is that Dakota Hudson threw a slider, right down the middle, and it was called a first-pitch ball. It was also maybe the least interesting part of the entire sequence. On September 14, the Dodgers beat the Cardinals 3-0. 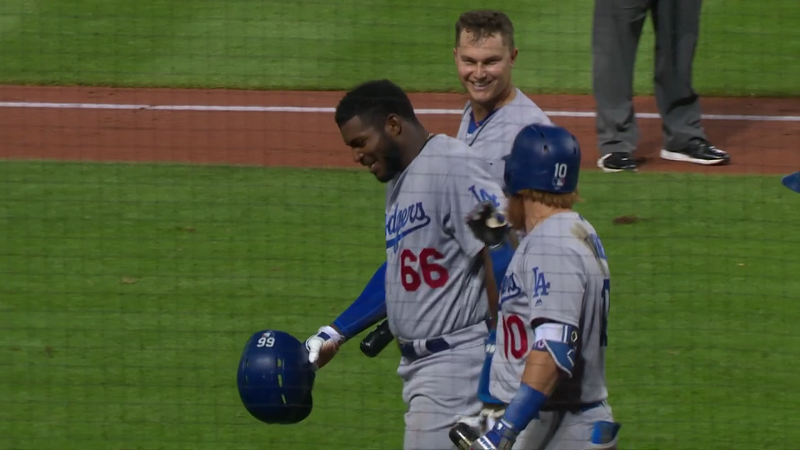 The Dodgers improved to 81-67, while the Cardinals slipped into an identical record. The story of the game was Walker Buehler’s eight dominant, shutout innings, but with two outs in the top of the seventh, the margin was only one run. The right-handed Hudson had to deal with the left-handed Joc Pederson. Cody Bellinger led off third base. Yasiel Puig led off second. Through that point in Hudson’s brief major-league career, he hadn’t thrown a single first-pitch slider to a lefty. He got the sign from Yadier Molina and prepared to throw his first. The slider wound up in the zone, middle-middle, and it seemed to catch Pederson by surprise, as he didn’t offer. It was a good way for Hudson to get ahead. Or, it would’ve been, had the pitch been called a strike. Home-plate umpire Marvin Hudson neglected to cooperate. You might have a little trouble spotting the baseball in there. It’s white, in front of the similar white of Molina’s right sleeve. You know you ought to be looking down the middle. The ball is down the middle. According to the numbers, we’re looking at a pitch that was 2.5 inches from the center of the zone as it crossed the front plane. And remember that the strike zone is actually three-dimensional. This pitch broke only closer to the center of the zone as it passed from the front of the plate to the back. It’s an extraordinary bad call, which is how it’s ended up being featured in this post. This annual post selects for the extraordinary, for the exceptional. Typically, when I write these posts, I try to offer an explanation that takes some of the burden off the umpire. Sometimes the pitcher badly misses his spot. Sometimes the catcher does a dreadful job of catching. And, typically, in the comments, some people chime in to say there are no excuses. The umpires have to make all the calls, and there’s no good reason not to see that a pitch was down the pipe. I assure you, in this instance, your opinion of Marvin Hudson is going to evolve. Right now, you probably think that Marvin Hudson screwed up. A few minutes from now, you’re going to see him as a hero. Here’s a clue. 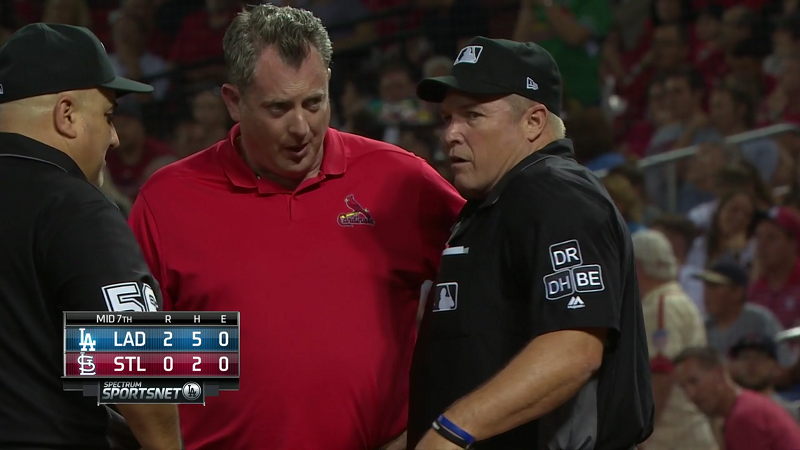 After everything was over, a Cardinals trainer came out to pay Marvin Hudson a visit. There’s another clue in there. The score has changed. No sense putting it off any longer — you should see the full video. I mentioned that, leading up to this, Dakota Hudson had never thrown a first-pitch slider to a big-league lefty. From Molina’s perspective, that was a pretty good reason to believe he was calling for a fastball. From Hudson’s perspective, maybe he thought Molina thought that meant it was the perfect time for a surprise. 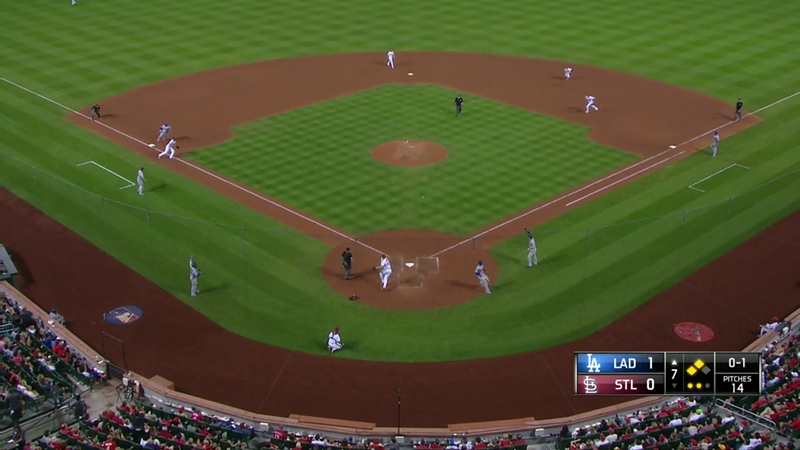 With a runner on second base, Molina had to go to multiple signs, so as not to give anything easily away. Molina thought he signaled for a heater. Hudson thought he’d signaled for a slider. Molina braced for 97 and straight, and instead he got 87 and bendy. The cross-up allowed the ball to get away, and 1-0 turned into 2-0, and 2-0 nearly turned into 3-0. Incidentally, there’s an important lesson in here about sign-stealing. 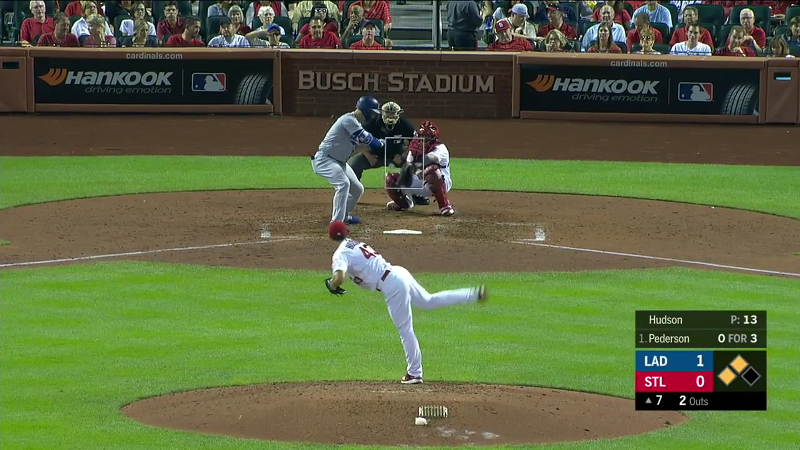 I don’t think any signs were stolen in this case, but we’ve got Yadier Molina behind the plate, and he’s outstanding, and still he couldn’t respond in time when the pitch wasn’t what he expected. Imagine being a hitter. Imagine you’re a hitter on a team that’s gotten good at stealing signs. How certain can you be that the signs are being stolen and interpreted accurately? If your teammates and coaches are 100% sure they know what’s coming, that can of course be greatly helpful. But if they get and convey the sign wrong, then as the hitter, you’re screwed. You can’t target one pitch and respond to another. If Yadier Molina can’t do it as a catcher, there’s no one who could do it as a hitter. It’s dangerous work. There’s a lot of potential for embarrassment. Find the baseball. Right. You found the baseball. You’ve found the ball, just as the ball found Marvin Hudson’s…you see where I’m going with this. Dakota Hudson crossed up Yadier Molina with a first-pitch slider at 87 miles per hour, and that same pitch wound up striking Marvin Hudson in a sensitive area. Umpire Hudson immediately and instinctively hunched over, but because the play was still going, he realized he had continuing responsibilities. And so he shuffled into one position. Then he shuffled into another position. He was in the right place to call Puig out at home. Only after it was over did umpire Hudson allow himself to feel the moment. It didn’t feel good. I understand adrenaline. I know there are stories of soldiers who keep running despite having been shot. I’ve seen hockey players attempt to continue shifts through missing teeth and broken feet. I know when I’m climbing, I don’t feel any of the various aches and pains until I’m off the wall. But I also know there’s no showstopper quite like getting hit square in the balls. The first time my brother and I ever had a snowball fight, I threw first, and I missed. He threw second, and he didn’t miss. His snowball was constructed with a solid icy core. It got me where you don’t want to be got. It was, more or less, the end of my day. As it happened, this was during a break on a day we spent horseback riding. I had to spend the next three hours on a horse. It was a whole sequence of very unfortunate circumstances, but the worst was the one icy circumstance. Many of you can relate to the feeling. Marvin Hudson took a slider to the crotch. This is 2018 — that slider would’ve passed for a fastball 20 years ago. It didn’t get there entirely untouched, but there was precious little along the way to impede the ball’s momentum. I know that he was probably a little protected. That protection is insufficient in the case of a targeted blow. It would’ve been entirely forgivable had Hudson just melted to the ground. Maybe he’d throw up on himself. We’d all get it. We’d all allow it. It’s one of the worst feelings that can ever be felt, and it’s felt at full bloom in an instant. Hudson kept on umpiring. He didn’t let his pain get in the way of his work. As such, I refuse to hold anything against him. And while, yeah, the pitch itself was right down the middle, I think we can probably agree on a rule of thumb: If, as an umpire, you ever take a pitch to the groin, you get to rule against the pitcher. Something along the way must’ve gone terribly wrong, and it would be asking too much for an umpire to reward his assailant. These are human beings, after all. 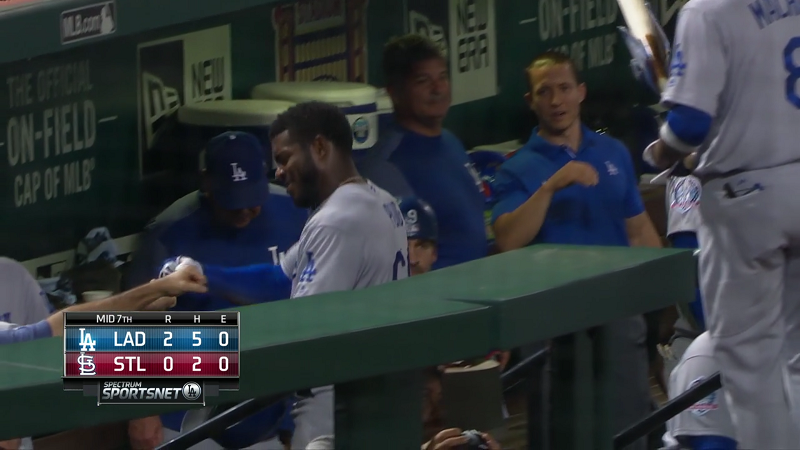 And Puig returned to a couple of fist-bumps. Everything in baseball gets fist-bumps. Get on base? Fist-bump. Intentional walk? Fist-bump. Make an out? Fist-bump. Just kind of standing there? Fist-bump. Baseball has its own unique existence, and fist-bumps are the coin of the realm. 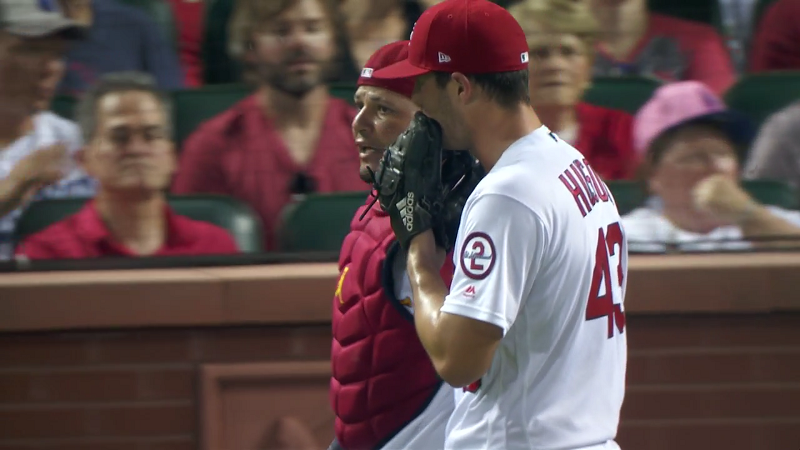 As the Cardinals walked off the field, Molina and Dakota Hudson approached one another to talk through what had gone wrong. Hudson, like a typical baseball player, covered his mouth with his glove, because he didn’t want to take the chance that anyone on the other side could ever possibly know anything. Molina didn’t bother. He wanted to be perfectly clear. There had already been one mixed message too many. We hoped you liked reading The Worst Called Ball of the Season by Jeff Sullivan! Not enough balls in this article. In the beginning there were at least two. At the end, perhaps less.